App Store developers who have been itching for a way to to keep an eye on their sales stats while on-the-go can finally rejoice. There is, at last, an (official) app for that. iTunes Connect Mobile puts iTunes Connect, Apple’s back-end portal for the App Store, in developers’ pockets. 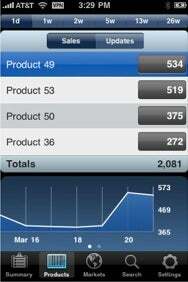 Daily and weekly data on sales and trends is available for both paid and free apps, as well as in-app purchases. As one might expect from Apple, iTunes Connect Mobile seems to be well-designed, though strangely the company only provided one screenshot for its iTunes Store entry. It also seems a bit odd that this is an iPhone-only app; iPad owners will just have to make due with the 2x button for scaling up iPhone apps, or perhaps consider purchasing an iPhone or iPod touch. iTunes Connect Mobile is available for free and requires iPhone OS 3.0 or later.